Welcome to the world Ethan Timothy Robert O'Hanlon. 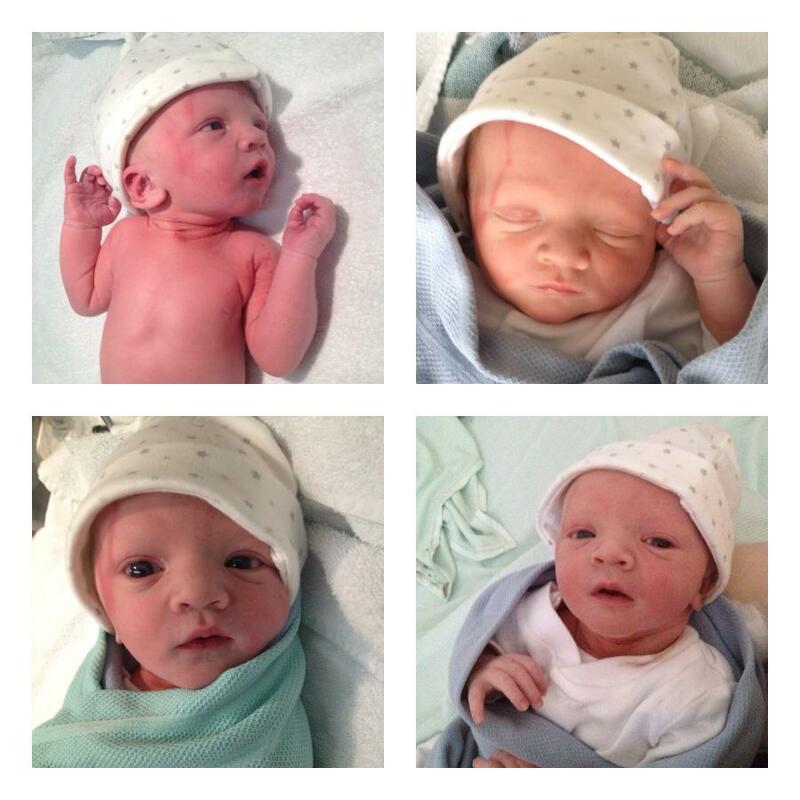 Born 5th May 2013 at 12.47am, weighing 7lb 4oz. I woke up at 2.05am as my waters had broken - turns out, these were just my back waters. Contractions started around an hour later. Called the midwifery unit and they said to come in after breakfast. First examination showed I was 1cm dilated and should be able to go home. Sadly, my blood pressure was too high and I went over to triage in the main hospital to be assessed. During the next six hours, I had to sit on a narrow, hard bed in a corner of a corridor, with contractions getting stronger. Second examination showed I was only 1.5cm dilated - not what I wanted to hear. Doctor advised I might have to go to the induction ward but then decided to transfer me to the labour ward. Finally, around 4pm, I went over to the ward and was at last allowed gas and air. My blood pressure was spiking and the pain was so strong, I didn't feel I was coping at all well. Third examination and I had made it to 2cm - big woop! Anesthetist came and told me about the epidural, which I gladly agreed to, to help my blood pressure. I was getting double contractions at this time and was finding it very hard to deal with. By the time of my fourth examination, they expected me to be 4cm - well, take that, I was actually 9cm! Two hours later, I was ready to start pushing. The epidural had made me so numb I couldn't feel a thing. After one hour of feeling like my head was going to explode, the midwives decided that I needed help. With the assistance of forceps, an episiotomy (ouch, ouch, ouch) and at least eight people in the room, Ethan was born quite suddenly at 12.47am. We spent the next hour cuddling and getting to know our little guy, then called friends and family to tell them he was here. After passing out in the shower, I finally had some food and was transferred to the antenatal ward at 6am, hoping to get some sleep. My drip battery died and I had to go to find a midwife. I had to do this again when it beeped to say it had finished. At 7.30am, with no sleep whatsoever since 2am the day before, the midwives opened all the curtains on the ward and declared it was breakfast time. I should have been discharged in the morning but in the end, we were released at 4pm, shortly after hubs / the new daddy and both sets of grandparents came to visit. We arrived home, shattered and quite bewildered - we were now parents. I came across your blog when looking for more info in the Serenity suite at City Hospital. Reading the blog entry above, it seems you didn't get to go into the birthing suite at all in the end, which I'm sorry to hear. We are hoping to have our baby there, but you just never know what sort of labour you're going to have; even if you've been low risk all throughout the pregnancy. What I wanted to ask you about, is what hospital you ended up in for the birth? Was it City? If so, how did you find it? I've transferred over to City from The Women's just so I can use (hopefuly) their birthing suite and I'm a little nervous about ending up in their labour ward. I've read some horror stories. Would be interested in hearing your opinion on it. Anyway, hope all is well with you and baby now.